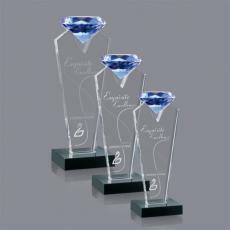 Diamonds have long been a symbol of value and high quality. 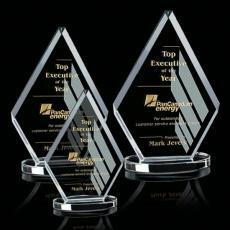 Used as recognition awards, they are an upscale and attractive way to reward high performance and winning effort. 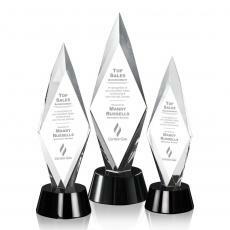 They speak of clarity and multi-faceted ability when used as trophies. 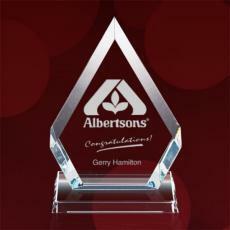 Diamond recognition awards show you value highly the contribution of your employee, executive or team leader. 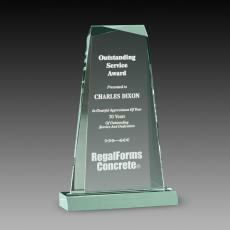 They come in a wide range of styles, materials and sizes. 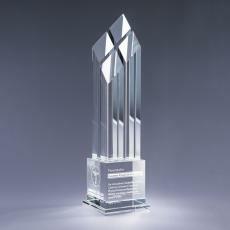 Crystal diamond awards are often set on the top of a column, which you can engrave with the recipient’s name and dates. Azure diamonds are especially attention getting, with their shimmering blue tint. 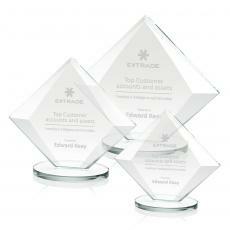 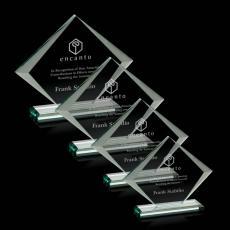 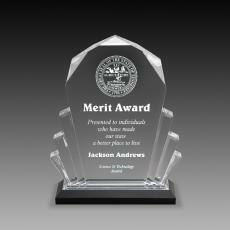 Acrylic personalized awards in the shape of a diamond let you engrave the diamond shape itself. 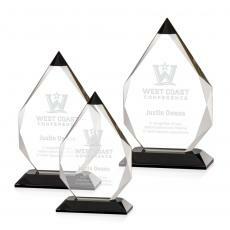 These can be tinted with colors like jade or ruby. 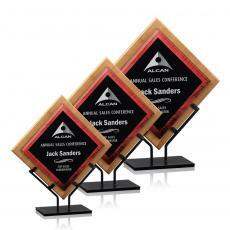 They attract the light and make a fashionable gift for display on a desk or case. 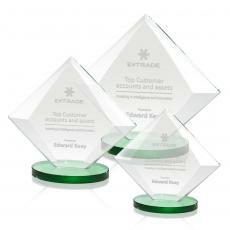 Or combine a crystal diamond on a wooden base, which is engraved. 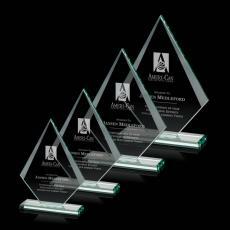 $38 - $64| Sizes: 10.25", 7.5", 8.25" & 9.5"
$30 - $40| Sizes: 4.5"x5", 5.5"x6" & 6.5"x7"
$115 - $155| Sizes: 6"x6", 7"x7" & 8"x8"
$64 - $89| Sizes: 6"x6", 7"x7" & 8"x8"
$65 - $100| Sizes: 10"x10", 10"x8.5", 7"x6", 8.5" & 8.5"x7.375"
$38 - $64| Sizes: 6.25", 7", 7.75" & 8.5"
$32 - $59| Sizes: 2.375"x2.375", 2.75"x2.75", 3.125"x3.125" & 4"x4"
$125 - $195| Sizes: 4"x7", 6"x9" & 7"x11"
$135 - $215| Sizes: 6.5"x8", 8"x9" & 9"x10"
$115 - $165| Sizes: 10", 8" & 9"
$110 - $160| Sizes: 10.75", 6.75" & 8.75"
$95 - $155| Sizes: 4"x7", 6"x9" & 7"x11"
$150 - $240| Sizes: 10", 6.5"x8" & 8"x9"
$200 - $390| Sizes: 6"x8", 7"x10", 8"x12" & 9"x14"
$125 - $225| Sizes: 2.75"x8", 3.25"x9" & 3.75"x10"
$85 - $115| Sizes: 4"x6.5", 5"x8" & 6"x9.5"
$140 - $320| Sizes: 10"x12", 4.75"x6.5", 6"x8" & 8"x10"
$72 - $96| Sizes: 7.5", 8.25" & 9"
$70 - $110| Sizes: 10"x8.5", 7"x6" & 8.5"x7.375"
$68 - $92| Sizes: 10", 7" & 8.5"
$95 - $145| Sizes: 10.75", 5.5"x6.75" & 6.5"x8.75"
$42 - $65| Sizes: 5"x4.5", 6"x5.5" & 7"x6.5"
$165 - $245| Sizes: 4"x11", 4.25"x13" & 4.5"x14"
$84 - $134| Sizes: 10.5", 12.5" & 14.5"
$295 - $675| Sizes: 12"x12", 6" & 9"